You are here: Home / Featured / Where in Deerness is this? 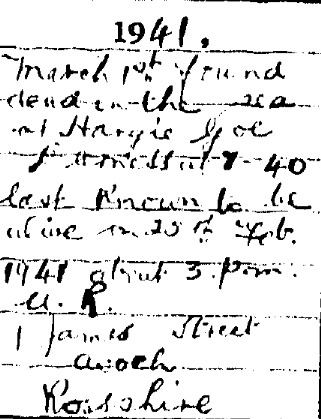 Can anybody in Orkney help decipher the place listing on a death certificate? The following is written as the place where the bodies were found of 2 of the crewmen of the SS Noss Head which sank in 1941. Its states that they were both found dead in the sea at Deerness, but the exact location is unclear. Look like this Horgies Gec or Harquis Geo. If anybody can help with this request, you can get in touch with us via the “contact us” button or via the comments section at the end of this post.